Hello everyone! My name is Adrienne. Welcome to my trip report. I graduated college and landed this amazing position with David’s Vacation Club Rentals. I am surrounded by amazing co-workers and everything Disney on a daily basis. 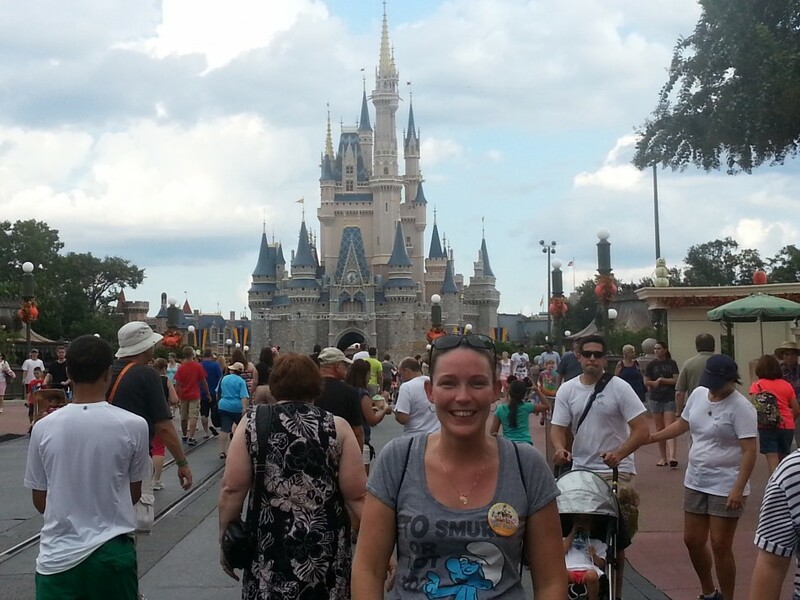 I never thought I would be fortunate enough to have a “research trip” to Disney World. 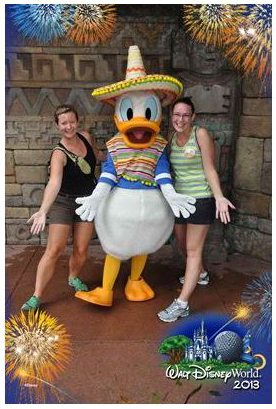 This was a girls-only trip, with Melissa, David’s daughter, and I, exploring all Disney has to offer. We left Friday evening and spent the night in Detroit, flying into Orlando, Saturday morning. After picking up our rental car at the airport, we headed to Wilderness Lodge to check in to our 1 bedroom Villa. I have seen several pictures of Wilderness Lodge; however, I was still in AWE when we arrived. 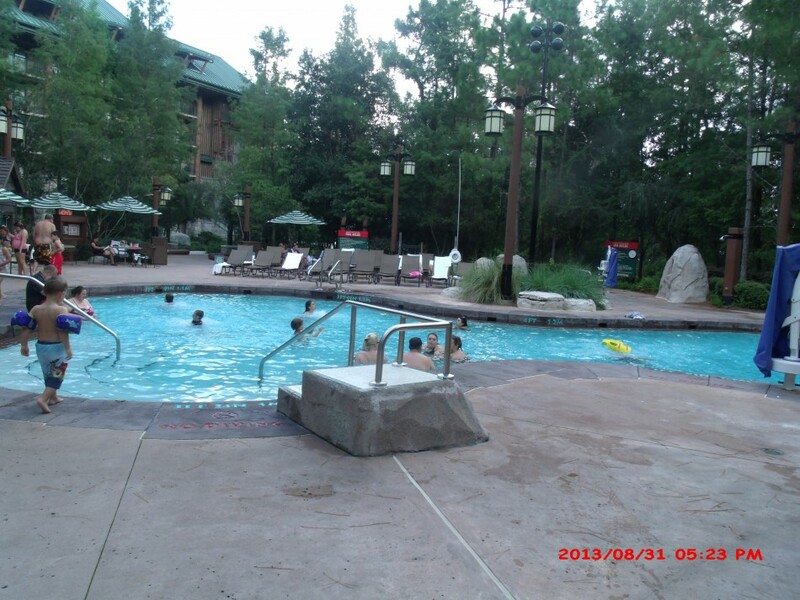 Wilderness Lodge is a very relaxed and comforting environment. We then unpacked in our wonderful room and left to catch the boat to Magic Kingdom, where we transferred onto the Monorail to Bay Lake Towers. We ate a great quick dinner at the Contempo Café and proceeded to the Top of the World Lounge. The view from the Top of the World Lounge was stunning. Not only was I able to see Magic Kingdom but a fabulous sunset. We then took the Monorail to the Grand Floridian, where the newest Disney Vacation Club resort is located. The Grand Floridian is a magnificent resort. The cast members are so friendly and the decor is warm and inviting. After taking the boat back to Wilderness Lodge, we sat on the beach and watched the Electrical Water Pageant. Sunday was a very busy day. We drove to Saratoga Springs from Wilderness Lodge. Saratoga Springs is a very peaceful resort. If you like walking trails and a down home quiet feel, this is the resort to stay at. Saratoga Springs is a very large resort and hosts the DVC model Villas for Animal Kingdom-Kidani Village, Aulani in Hawaii and the Grand Floridian. We were also very lucky to have a great DVC Guide, JT (I believe, who not only gave us a very informative tour of the studio and one bedroom Villa model suites, he also gave us a tour of the Grand Villa at Saratoga Springs. I was in AWE by the size and home feeling of the Grand Villa. After touring Saratoga Springs and the model units, we drove to Old Key West, which is a short drive away. Old Key West was very busy, as many guests were gathering to leave for their cruise. In my opinion, this resort resembles condo living with the 3 story walk up buildings. The décor of the resort was very pale, calm cooling colours. There is a boat dock at Old Key West where you can board a ferry that goes to Downtown Disney. We then drove to Beach Club Villas, where we ate lunch at Beaches and Cream. After lunch, we walked to Boardwalk Villas. 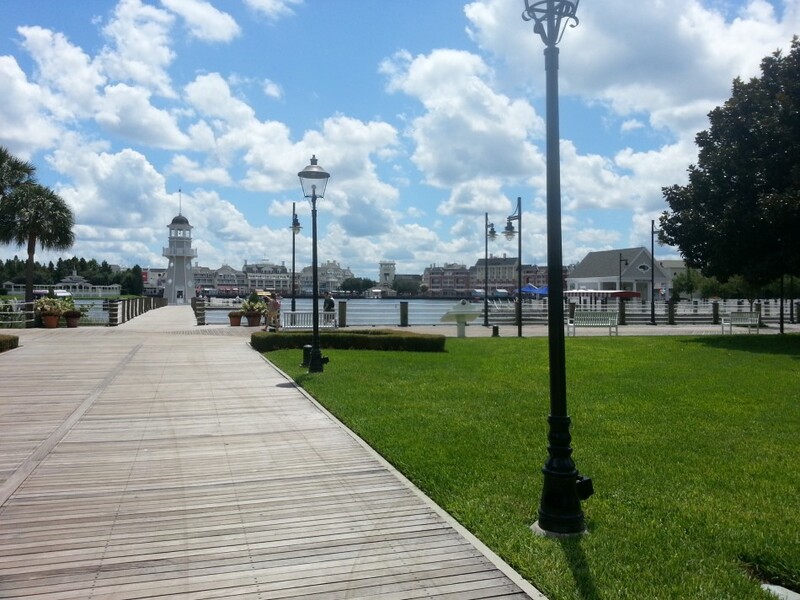 This was a nice 5 minute walk from Beach Club to Boardwalk Villas, using the walkway around the water. There is also boat transportation between Beach Club, Boardwalk, the Swan & Dolphin, Hollywood Studios, and Epcot. We continued to walk back to Beach Club, then drove to Animal Kingdom Lodge. We parked close to Jambo House and walked to Kidani Village. This was about a 7 minute walk. We toured Kidani Village, including the pool, kids’ splash pad area and the Savannah. The views of the Savannah are amazing and we were able to see many animals. Animal Kingdom Lodge has many authentic cultural displays and most of the décor is made of wood materials. I felt like I was far away from the outside world and was welcomed by my family upon walking into Animal Kingdom Lodge. We returned to the resort to change for our dining reservations at the Plaza Restaurant in Magic Kingdom. I had the meatloaf and Melissa had the veggie sandwich. The food choices were great. After a few rides, we watched Celebrate the Magic and Wishes, facing Cinderella Castle. Celebrate the Magic is a light show that makes Cinderella Castle come to life in a heart-felt tale of Disney, followed by the phenomenal Wishes fireworks show. This is a very magical moment. We then took the boat back to Wilderness Lodge. Monday was pool day, as Sunday was an extremely busy day in which we were able to get through more information than Melissa had planned. This was the only day we slept-in, until about 9am. We had breakfast in our room, which we did every morning, and then proceeding to the pool for the afternoon. We purchased lunch from Roaring Fork, which is a quick service restaurant with great food and proximity to the main pool. We headed back to our room mid-afternoon and prepared for our dinner reservations at Chefs de France in Epcot. We took the bus to Epcot from Wilderness Lodge. The bus ride to Epcot was about 22 minutes as we stopped at Fort Wilderness Campground on the way. We arrived early to Epcot and I was able to take in some of the attractions at the World Showcase, which is an amazing section of Epcot where you are able to taste different foods from all around the world, as well as purchase different items from each country. We were 25 minutes early for our dining reservations at Chefs de France; however, we decided to check-in and wait to be called. We were delighted when our hostess escorted us to our table within 3 minutes of arriving. Melissa and I both had the 3 course meal. Melissa had the salad for her appetizer and I had the French onion soup – I must add this soup was amazing. We both had the chicken, veggies and potatoes for our main meal and the strawberry desert. We then walked around Epcot taking in a few attractions prior to closing at 9pm. We took the bus back to Wilderness Lodge, which was about a 6 minute ride, as we did not stop at Fort Wilderness Campground on the way back. I was very impressed with Disney’s bus system. 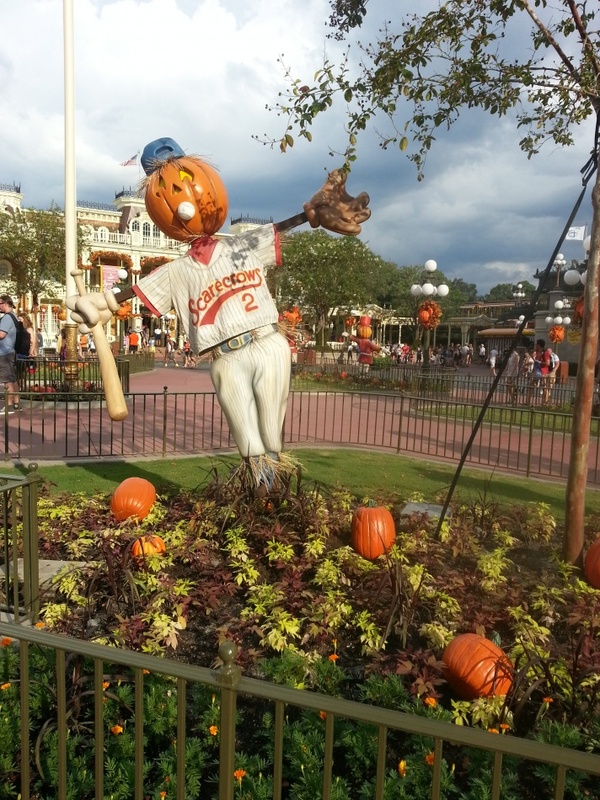 Tuesday was our last full day at Walt Disney World. This was the day to make rope drop at Animal Kingdom park. Sadly, we were 3 minutes late for rope drop due to traffic. We took great pleasure in the Kilimanjaro Safaris tour. Our tour guide was not only knowledgeable of all the safari animals, but he was also comical. We then walked through Animal Kingdom park, where we were able to view incredible gorilla families, as well as many other extraordinary animals. I was thrilled to conquer Expedition Everest, not once but twice. We watched the, entertaining, 3-D It’s Tough to be a Bug show, and went on the thrilling Dinosaur ride before leaving for Hollywood Studios. We ate at the ABC Commissary quick service restaurant. After a few rides, we walked towards Tower of Terror, this is the ride I feared the most prior to leaving for Disney; however, I managed to overcome my fear and rode the Tower of Terror twice. Each time was in a different elevator and a new experience as well. We headed back to the resort to get ready for our dinner reservations at the Grand Floridian’s 1900 Park Fare. We were anxious to dine with Cinderella and family, however, we had some spare time so we spent an hour in the quiet pool at Wilderness Lodge before leaving. Upon checking in for your dining reservations at 1900 Park Fare, your picture will be taken and available for purchase during your meal. The characters were indeed great at playing their part and made contact with Melissa and I soon after we started eating. I thought the food was great and the desserts amazing. I would definitely dine at 1900 Park Fare in the future. We then took the Monorail to Magic Kingdom and spent the evening enjoying the rides. We watched some of the fireworks while riding Dumbo and a magical experience for Melissa and I was walking through Magic Kingdom and seeing Wishes come together above us. I stopped in my tracks and was flabbergasted by these fireworks. We then headed back to spend our last night at Wilderness Lodge. I thought I would have a favourite resort when I returned from this research trip, however each resort has its own décor and theme. Walt Disney World has something for everyone, no matter your walk of life, and you will feel at home while there. I am looking forward to planning a Disney trip for my 2 young boys and would opt to stay at Animal Kingdom Lodge or Wilderness Lodge, as my children are both into these themes. Thank you for reading my Trip Report!